The GNX1™ is much more advanced than the conventional amp modeling processors to date. 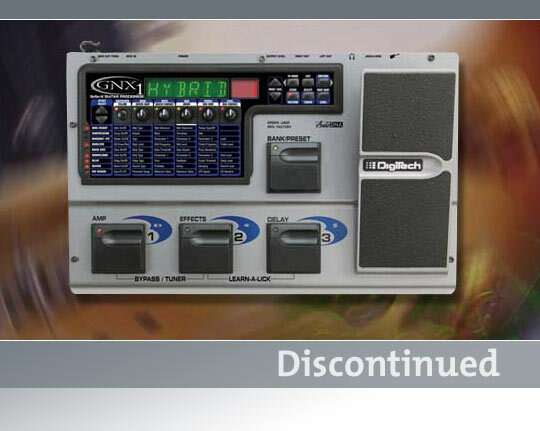 Thanks to DigiTech's AudioDNA™ DSP Engine and the software power provided by GeNetX™, the GNX1™ allows the musician to literally create their own amp model, their own speaker cabinet, their own signature sound. The GNX1™ provides several of the most popular amp models and speaker cabinets to choose from and GeNeTX™ provides the tools and technology to "warp" the characteristics of these components together into your own "Hypermodel". The GNX1's awesome amp creating ability is also enhanced with a complete library of studio quality guitar effects that made DigiTech famous. The GNX1 also includes DigiTech's® Learn-A-Lick™ feature, which samples those "speed demon solos" and then slows them down to one-quarter speed while retaining the original pitch. The GNX1's Rhythm Trainer provides 30 different drum patterns to practice against, a perfect tool for improving your timing. When you put all of this power and technology together in a rugged steel chassis, complete with built-in Expression Pedal, assignable LFO Filters, full MIDI implementation, and a user-friendly interface, and you have the most complete and comprehensive guitar system to date. Signal to Noise Ratio Greater than 95 dB; ref = max signal, 22kHz measurement bandwidth. Dimensions Length 14.5" Width 9" Height 3"
Can you make a hypermodel from a hypermodel? Yes, you can. Once you have created a hypermodel, it can now be selected as either a red or green amp and combined with another amp to create a second generation hypermodel. Modeling gets you as close to the sound of your favorite amp without actually having to own one, thus saving you thousands of dollars and lots of space. with limited control over that sound. Do GENETX products still do modeling? Yes, they do. Each GENETX product has factory based models of popular modern and vintage amplifiers. What does the Warp control do? The Warp control allows you to combine the characteristics of any two amp models in varying ratios. This resultant ratio can then be saved off as a new hypermodel. How many hypermodels can I save? The GNX 1 allows you to save off 9 user hypermodels within the GNX1's internal memory with the GENEDIT Computer Editor Libarian software you can save off as many hypermodels as your hard drive will allow. These can then be imported to the GNX as needed. Isn't Warp just pan or a crossfade? No, warping extracts the characteristics of each amp and combines the two into a completely new sound. Whereas panning or crossfading simply increases the level of one while decreasing the level of the other, while not actually combining their actual characteristics. Cabinet tuning is as if you actually changed the size of the cabinet and speaker system's physical dimensions, making it larger or smaller. This changes a cabinet's response and resonance characteristics. Can a I warp between 2 amps in real time? Yes, This can be done either via the expression pedal, internal LFOs, or MIDI CC control. There are three different ways you can warp: you can either warp between amp models only; you can warp between speaker cabinets only; or warp between amp/cabinet combinations. How does the GNX differ from the Genesis? The GNX is designed primarily as a live performance system and the GENESIS 3 is designed primarily for recording. Although the GENESIS 3, with the optional foot controller, can be used for live performance as well. Can I use Genetx products as a multi-effects? Yes, every GENETXs product is equipped with a vast library of studio quality effects. When I create a hypermodel does it sound good? We're confident that the combination of any two amp models will produce exciting new sounds and we absolutely encourage you to experiment. We also invite you to join our online community of users in sharing your creations with others. After downloading updated firmware, my unit shows "TOE DOWN" in the display, what do I do now? TOE DOWN represents a prompt to calibrate the pedal. Rock the expression pedal all the way in the forward position and press the footswitch that is flashing, (On GNX2 this is the EFFECT footswitch, on GNX3 it is the CHORUS footswitch) The diplay will show "TOE UP" Rock the exression pedal back towards you and press the lit footswitch (Delay) It now shows VSWITCH, push the pedal forward and put pressure on the toe, then back the pedal off again. How is GeNetX better than modeling? A. Modeling essentially is an end point in your sound. You can select 1 amp type and have minimal control over the tone gain and that's it. With GENTEX processors, you can create your own model from any 2 models and then combine it with other models to create 2nd and 3rd generation amp models that were never before available. The GNX 1 allows you to save off 9 user hypermodels within the GNX1's internal memory with the GENEDIT Computer Editor Librarian software you can save off as many hypermodels as your hard drive will allow. These can then be imported to the GNX 1 as needed. The warp control changes the ratio of the characteristics between the two amps (for example: 25% Blackface, 75% British Stack). Once you've created an overall ratio between the two that you like you can actually save that off as an individual amp hypermodel. How does the GNX differ from the GENESIS 3? What is the hard reset for a GNX1? Press and hold Rhythm button. When Reset? appears in display,let go of Rhythm. Press and release FX MODE button. Put Toe Up, press and release flashing footswitch. Put toe down on expression pedal, apply pressure to toe until V Switch value in the display increases.